One of the most odd viral sensations I’ve seen online this year is before and after pressure washing photos. It sounded strange to me when I first heard that people had an affinity for these pictures and videos, but looking through them, I started to understand. People seem to be finding great satisfaction from this extremely effective way of cleaning. The cool thing about pressure washing is that you might not have even known how extremely dirty and worn something was before it was power washed. Pressure washing is usually pretty affordable and if you haven’t tried it before, here are a few areas in your home that might benefit from a good high powered rinse. Maybe when you’re done, your home will go viral too! One of the most common before and afters i’ve been seeing is the driveway. This is probably because your driveway can get extremely dirty, and most people don’t give a second thought to it. It’s not an area that people clean often, but every once in a while, and especially if you’re about to put your home on the market, or show it off for any reason, it’s a great finishing touch. Decks take on a ton of wear from the outside elements. They tend to take on layers of dust, and grime in the crevices between the boards. If you have a deck, it really requires that you pressure wash it every once in a while because it’s nearly impossible to clean it any other way, with the same level of effectiveness. It requires high pressure to get the gunk out from all those cracks and power washing is simply the fastest way of getting it done. Something people often never think about until they own their own home is how dirty the outside of it can get. When you buy a home, your first impression of it is the outside, so it’s likely you fell in love with the color of the outside of your home, or changed it to something you loved after purchasing it. After taking on rain, snow, sleet, wind, dust and the millions of other elements that can dirty up your home, it’s probably changed shades without you even noticing. 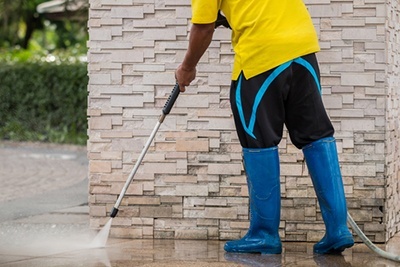 Power washing the outside of your home can restore it to its former glory within hours. The other option is scrubbing it down yourself, but it’s much less effective for getting hardened dirt off, and takes much, much longer.